Me during my first few months here in Australia... LOL! Having lived in Australia (which was once upon a time named New Holland) for a bit over two years now, here are some major differences that I've dealt with stumbled upon since moving from (America to) the Netherlands (and then back to America, and then) to Australia. LOL! Are you still with me? OK, then. Here we go! Size — The Netherlands is tiny. But very full. It's slightly less than the state of New Jersey x 2, but it has a population of about 17 million people. Australia is huge. But it's almost empty. It's almost the same size as the contiguous United States, but it has only 22 million people, which is less than the population of the entire state of California. Mosquitoes — In the Netherlands, they're muggen. In Australia, they're "mozzies." Either way, they're just as annoying here as they are in the Netherlands. However, the Dutch mosquitoes still win (by a wing!) when it comes to how annoying they are when flying near your ear. Never in my life have I had so many mosquitoes buzzing around by my ear at night while I tried to sleep than while I was living in the Netherlands. 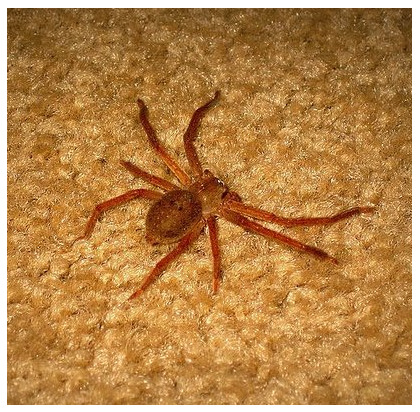 A Huntsman spider in my home recently. 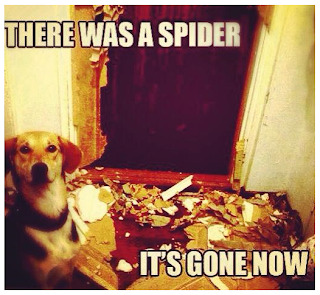 There are also redback spiders, funnel-web spiders, mouse spiders, plus more. 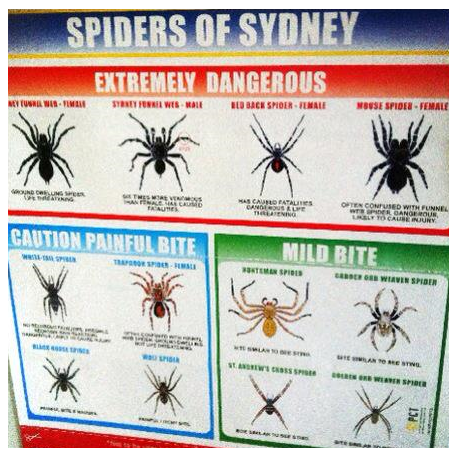 A detailed sheet of which spiders to watch out for in the Sydney metro-area. Snakes, I have no issue with them. But Australia has the most deadly snakes in the world. The worst that I know of near me is the brown snake. I haven't seen one yet — I've only seen a long carpet snake in the middle of the road because it was hit by a car. I see more dead kangaroos on the side of the road than snakes anywhere in the outdoors. Snakes or spiders in the Netherlands? Um, you have nothing to complain about over there. Seriously. So don't. Cars, Roads, Houses, Supermarkets — All big. I got (sort of) used to the smaller sizes of cars, houses, streets and grocery stores in the Netherlands. Sort of. Then I came to Australia. On my first day here, I went into a Woolworths in the Paddington-area of Sydney to pick up some breakfast foods for the hotel room in the morning. I was overwhelmed by not only how close the supermarket was to an American supermarket, but also that in itself it was just... Huge! I felt like a kid in a candy store, honestly. Streets in the Netherlands are smaller in width normally, but here in Oz they like to have very wide roads for their big cars. Big parking spaces. Homes in the Netherlands are quaint. They're tiny, usually, or they're big but have crazy and dangerously steep staircases. The homes are usually built with brick. I loved the homes there on the exterior, especially if they had stormluiken (storm shutters) which were decorated (like these seen here). The gardens are typically tidy, and the garage (if one has one) is usually quite tiny as well. Homes in Australia are average to massive in size. They are normal-sized homes, really. Most homes are built with brick here as well. It's typical to drive through a neighborhood and notice several different types of brick used on the homes. No two homes standing next to each other are likely to look alike, and I like the Federation-style homes here too. Barefoot — Speaking of supermarkets, here in Australia (especially near the beaches) people are commonly seen shopping without shoes on. I'm not going to knock bare feet. Whatever is your prerogative, as long as it's not harming anyone, go for it. Anyway, I went to an open house for an apartment and one prospective renter decided he'd come look at the place in his board shorts and bare feet. It made me laugh, honestly. I often see people (typically younger men) waiting inside of McDonald's without shoes on, but it's even funnier to see people shopping in a supermarket without shoes on, after living in the Netherlands, where women seem to get very much dressed-up just to go to the Albert Heijn to pick up some coffee, cookies and milk. Dutch women vs Australian women — Apart from the fashions (seriously), most Dutch women look Dutch. And Australian women look, well, Australian. But getting beneath the surface, Australian women are a lot easier to approach. They typically don't wear much makeup, and they try their best to stay out of the sun since UV rays are very strong down here. Dutch women also typically don't wear much makeup, and they seem to flock to the outdoors like bees to a hive whenever the sun comes out. With how little the sun shines in the Netherlands, though, can you blame them? Public transportation — I think the public transportation in the Netherlands might be better than the public transport in Australia. Although the system down here is great, it doesn't cover the areas one might want to get to efficiently enough. For example, and those of you who live in Sydney will understand this one, take the Manly-area of Sydney. If you're coming from Circular Quay, where the Opera House is, no problem. You just take the Manly Ferry from Circular Quay. But that's the only way, other than sitting on a bus or hailing a cab. There isn't train service to that area, while Bondi and Cronulla have train service. Sticker shock! — Yes, the cost of stuff here is also ridiculous. Australians and Dutch people alike are paying way too much for stuff. So I will continue to buy many products, like makeup, from America via eBay or whatever other source instead of paying 3+ times the price for it down here, when I know I can get it for less, even after the cost of shipping. Excuse me, thank you and I'm sorry — They say this here a lot. In the Netherlands, I'd have to stretch my imagination and pretend that someone was saying "excuse me" after bumping into me with their shopping trolley. But here in Australia a majority of the people will apologize and then some. And most refer to each other as "mate." That's still very nice to hear, even after two years. Weather — In the Netherlands, it just gets cold and rainy. And rainy and cold. Sometimes it snows. Sometimes the lakes and canals freeze over. Sometimes the sun comes out. Sometimes it's too hot and this makes the Dutch people grumpy. They seem content with their rain and snow, really. I mean, overall, that is what they're used to. In Australia, depending on where you are, it can get down to 0°C at night (Canberra, Australia's capital, seems to be one of the coldest places down here). Melbourne gets a lot of rain and 4-season weather. Sydney is warmer, but it does get cold in the winter months. No snow, but 2°C is also nothing to shout about, if you don't like cold weather. There's more sun to make up for it, though. Brisbane, up near the Gold Coast, is much warmer. I have friends who live up that way who complain when they have to wear a sweatshirt in the winter. The summer in Sydney can get up to 45°C or more, but an average day is somewhere around 30°C in the summer. It took me ____ hours/days to get across the country — In the Netherlands, it only takes a few hours (if you don't have traffic jams to face) to cross the entire country. In Australia, it will take you days or weeks, depending on how fast you travel and how many people are in the car who can take turns driving. Culture shock? — I have not had culture shock since arriving here. At first, I thought I better be prepared, just in case, but it still hasn't hit me, really. I experienced culture shock twice, majorly, in the Netherlands within 7 years. But can it happen to someone else? Yes. You are not free from homesickness if you move to Australia. First of all, it's an island. A big island, albeit, but it's still an island. And it's on the other side of the world. But I feel often like I am in a bubble; in the Newport Beach/Avalon-area of Sydney in the Northern Beaches, I feel like I am in Newport Beach and Laguna Beach, California. With the gum trees, lemon trees and palm trees everywhere, it reminds me of some obscure place in between Laguna Beach and San Diego. Australians are a lot like Canadians, actually. They're like America's laid-back cousin. 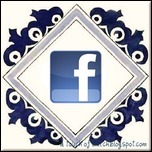 If you are currently living abroad, where are you originally from and how does it compare to where you are living now? As an Aussie living in Holland this was fun to read! Regarding the 'mozzies'...there just seems like more here in Holland because they haven't worked out the marvellous invention of screens on windows & doors! Also my sons think they should be able to claim asylum because Australia has so many dangerous spiders and snakes! When we kill a spider here all the Dutchies are horrified and tell us to carry it outside! Ha! Not this Aussie! Only good spider is a dead spider! I would not say I am scared of spiders but if I saw one in Australia I think I would freak. Anonymous - You're right! No fly screens on the windows in NL. This used to really bother me. I bought some cheap fly screens at Xenos to put over the windows (with velcro), but that was a yearly temporary fix.